It may be the final tragedy of the Holocaust. For years, many survivors and their families have tried in vain to collect assets deposited in Swiss banks before the war. Most were turned away empty-handed. 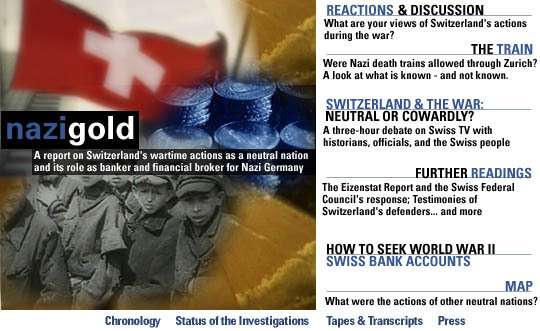 Today, new information about Switzerland's financial relationship to the Nazi war effort has blemished its long-held reputation of neutrality. FRONTLINE examines the Swiss role in supporting Nazi Germany and explores the internal political events in Switzerland that allowed their border police to turn fleeing Jews away, into the hands of the Gestapo. The film also examines the Swiss response as they have been forced to address Holocaust survivors seeking reparations.